(New Britain, Conn., June 8, 2017) – The New Britain Bees of the Atlantic League of Professional Baseball have introduced Bee Cams, providing fans the ability to view different live camera feeds of the Bees’ home games. The technology, provided and developed by Heads & Tails, Inc., allows fans to choose from ten different camera angles and perspectives. Heads & Tails developed the comprehensive Bee Cam platform from camera lenses to the platform’s highly scalable distribution via Verizon’s Content Delivery Network (CDN). Cameras are connected to the Verizon wireless network, with the content distributed to the public using Verizon’s CDN. In the middle, software aggregates the ten feeds providing viewers the opportunity to pick and choose the camera they want to watch from a single web page. All production is managed by Heads & Tails 2,200 miles away in Southern California. Viewers can watch the Bee Cams via Facebook, LinkedIn and YouTube using an HTML5-capable browser on their personal computer, or on the three social networks’ apps on tablets and smartphones seeing the game as it happens from the camera angles they want to view. The web page also provides viewers the ability to switch from camera to camera, including the “Ump Cam,” featuring an over-the-catcher’s-shoulder perspective of the ball coming to home plate and the batter readying for the pitch. Loiacono is no stranger to breakthroughs in sports camera angles. In 1991, while Vice President of Marketing for The Upper Deck Company, Loiacono debuted The Upper Deck Cam in New York’s Madison Square Garden, Chicago Stadium and the Los Angeles Forum providing NBA basketball and NHL hockey fans a unique view from the scoreboard. New Britain Bees’ game webcasts inspire fans with a view of the game as never seen before. Imagine cameras showing umpires rubbing down official game baseballs, with clay and many other rarely seen angles, providing a backstory around each pitch, hit, catch or run. 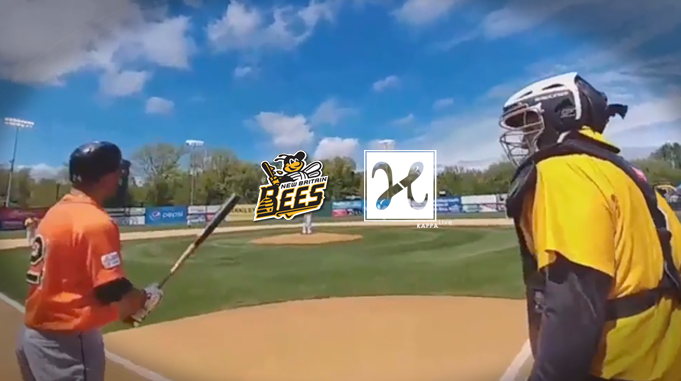 “The action we’re capturing with the Bee Cams brings the idea of inside baseball home to everyone who watches a Bee’s home game,” added Phil Loiacono. “The camera views are so vivid that you can almost see how the grass moves under an outfielder’s feet, hear the crack of the bat and the sound of a catcher’s glove when a 100 mph pitch snaps into it. This is baseball like it’s never been seen, or heard, before. The New Britain Bees are members of the Atlantic League of Professional Baseball, playing all home games at New Britain Stadium. Opening Night is April 21st against the York Revolution, with first pitch at 6:35 PM. Tickets for the 2017 season, including Season Tickets and Mini-Plans, are available by calling 860-826-BEES (2337), online at NBBees.com, or by visiting the New Britain Bees’ Front Office. About Heads & Tails, Inc. Heads & Tails, based in Bonsall, CA is marketing innovation and media company. Founded in 1992, Heads & Tails works with companies across the USA developing breakthrough marketing programs including Ford Motor Company, Alliance Rubber, Cisco, Verizon, Nascar, True Timber and others.